(Nanowerk News) Located in the Engadine, Zernez has set the goal of using only renewable sources to meet its energy requirements for buildings in the municipality, thus reducing CO2 emissions to zero. 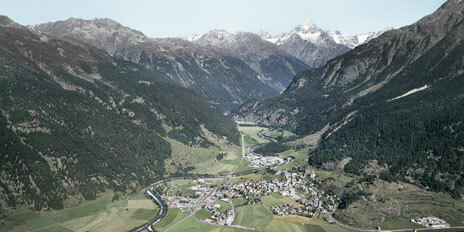 The project, Zernez Energia 2020, is supported by the Swiss federal government. An interdisciplinary team from ETH Zurich in the fields of urban design, building systems, construction physics, energy research and ecological system design are closely involved in the project. These researchers have analysed the feasibility of the project and now present the initial findings in an exhibition. The conclusion is that essentially the ambitious goal is possible and will not compromise the townscape, though perhaps not before 2020. Zernez: a village planned to be CO2 neutral. To reduce energy consumption, the researchers have proposed measures including the refurbishment of buildings and converting oil heaters and electric heating to district heating from the municipality’s woodchip heating system and to heat pumps. This transformation depends heavily on the active participation of house owners. “These measures can greatly reduce CO2 emissions, but not completely to zero,” says Michael Wagner, project manager and colleague of Kees Christiaanse, Chair of Architecture and Urban Design at ETH Zurich. In order to achieve CO2 neutrality in the medium term, however, the researchers propose to offset the remaining emissions by increasing the amount of power Zernez produces locally from renewable sources and selling this power to the Swiss grid. There are plans to build small hydropower plants and use more solar energy. Similarly, wood from the local forests will be used for the central woodchip heating system. In principle, the project goals could be met by 2020. The construction of this kind of infrastructure, however, would be very expensive for the municipality if it is to cover its current energy needs and offset CO2 emissions. In addition, an infrastructure based on current requirements may be too large in the medium and long term, as researchers assume less energy will be required in the future thanks to energy-saving measures. Wagner predicts that local production will be geared more towards reduced fuel consumption and lower CO2 emissions. As a result, the project goals are likely to be achieved only between 2040 and 2050. A central part of the project is that future new buildings are constructed in the village centre rather than on greenfield sites on the outskirts. This sort of densification enables cooperation projects between new and old buildings. “An old building, for example, can source its heating and hot water from modern, efficient building services in the new building next door,” explains Wagner. The energy goals could therefore be reached without necessarily having to upgrade all buildings. “ In particular, architecturally important old buildings don’t have to be covered with a thick layer of insulation, which preserves the townscape.” An intact townscape is crucial in ensuring that Zernez remains attractive to tourists. An example of this type of collaboration is Röven 8, which will provide assisted living flats for the elderly in the village centre. The project consists of an old barn that is being converted and a new building; the two will share building services. The project exhibition is currently taking place in the old building of Röven 8.